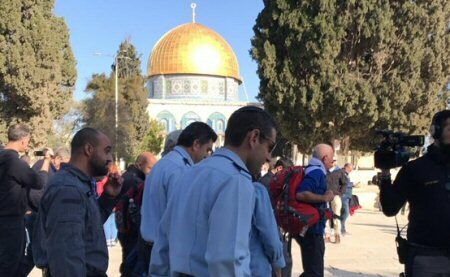 A large number of Israeli settlers and Israeli police stormed the Dome of the Rock, inside the Al-Aqsa Mosque compound, in the Old City of Jerusalem, on Thursday afternoon. Head of the public relations office at the Islamic Endowment Department, Firas al-Dibs, confirmed that 41 Israeli settlers and 85 members of the Israeli police force stormed the compound through the Moroccan Gate. Al-Dibs said, according to Ma’an, that Israeli police were deployed heavily across the area, and that a number of Israeli police stormed the Dome of the Rock mosque, which is situated inside the Al-Aqsa compound, and several Israeli settlers entered into the women’s prayer space, while Muslim women were performing prayers, inside.